In presenting this book, the author and memorials of her grandfather expresses a unique documented story. It proves an honest and well documented history with modesty, of the incepcion of this noble family and immigration to Mexico City and throughout the United States. Pedro Balli third printer of La Nueva España (Mexico City) and frontispieces of books he printed. The Coat of Arms earned by nobility to the Ballis by serving his Majesty King Alfonso XI. A Royal Grant given to Nicolas Balli Perez in 1765 by King Carlos III which became "Padre Island." The colonization and establishment of forts and villages in Nuevo Santander first explored in 1575. The purpose to incorporate the colonias with La Nueva España and to Christianize the Indians. 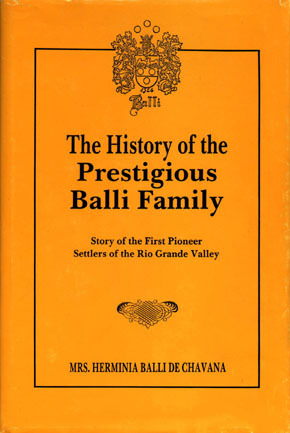 The Balli, Hinojosa, and Cavazos families who arrived in 1749 and became the first settlers of Nuevo Santander and grantees of Porciones on both sides of the Rio Grande in 1767. Lieutenant Juan Antonio Baili Guerra performs as judge of the five villages: Reynosa, Mier, Laredo, Revilla, and Camargo.